Born on 26 August 1878 in Ottawa, Ontario - husband of Hazel Wood, Ottawa, Ontario - at the time of his enlistment in 1915: trade as salesman; married; currently a member of the 43rd Duke of Cornwall's Own Rifles (twenty years); Presbyterian; height of 6 feet 0 inches; chest of 38 inches fully expanded; fair complexion; blue eyes; fair hair. 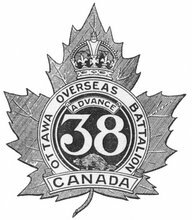 Joined the 38th Battalion, CEF, in Ottawa, Ontario, on 1 February 1915 - served with the 38th Battalion during its period of garrison duty in Bermuda - landed in France with the 38th Battalion on 13 August 1916 - sent to England for duty on 26 August 1917. Awarded the Distinguished Service Order - official citation: "For conspicuous gallantry and devotion to duty when in command of his battalion. He co-operated with another battalion in an attack with great courage and skill, materially assisting in the capture and subsequent consolidation of important positions." - unit recommendation dated 1917: "Performed valuable work during attack on Vimy Ridge. He also later took command of the Battn. and remained continuously on duty until the Battn. was relieved." Awarded a Mention in Despatches - no citation - unit recommendation dated 3 March 1917: "For distinguished and gallant services and devotion to duty." Awarded a Mention in Despatches - no citation - unit recommendation date unknown (announced 28 December 1917): "For valuable services rendered." Promoted lieutenant-colonel and appointed commanding officer of The Ottawa Highlanders on 1 June 1923 - relinquished command on 1 June 1927.